RLE’s founding fathers (and son). In November 1984, a small group of family and friends in La Mirada, California had a big idea – they wanted to develop and produce robust, effective, easy to use environmental monitoring products. Out of this idea came Raymond and Lae Engineering. And like all good tech companies, it all began in a garage. In 1992 the Raymond and Lae families packed up their kids, their dogs, and their company and relocated to Fort Collins, CO. The lure of fresh air, open spaces, and local manufacturing opportunities made the transition irresistible! And RLE has been here ever since. 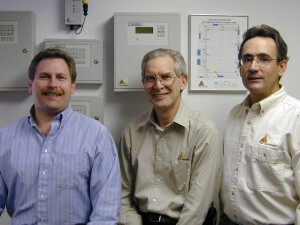 Through 30+ years of hard work and innovation, RLE has grown from a shop in a garage to the leading provider of water leak detection systems and web-based monitoring solutions for mission-critical facilities. We are proud to spotlight our manufacturing processes and dedication to the local economy – all of our sensing cables are manufactured and assembled in the USA, as are a vast majority of our core products. We proudly provide personalized, knowledgeable customer service and support for all of our products. In-house design services allow us to design and assemble custom panels. RLE’s UL 508a status allows us to UL certify the custom panels we create. Want the the whole story?